The 2001 vintage saw a very dry winter to start the year, followed by early season warm temperatures which kicked off the growing season. Many vintners were subjected to lots of stress as the temperatures plunged to freezing levels as the vines were just starting to grow, threatening the tender shoots. As usual, we heard reports of gloom and doom, only to read after the harvest stats were completed, "things weren't as bad as we thought." In fact, the dry weather and warm summer allowed the fruit to ripen with ease, unless a grower was really greedy and had over-cropped. 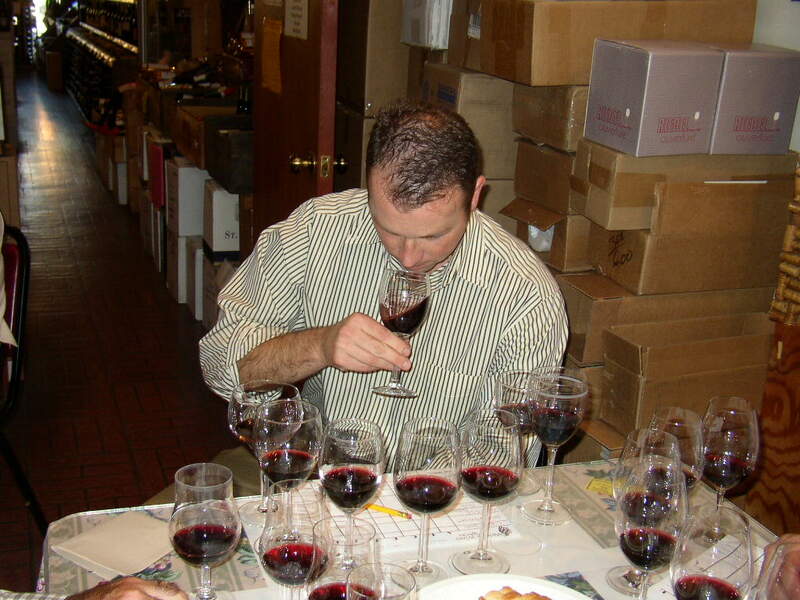 Now that the wines are coming to the market, we're hearing glorious reports regarding quality. We assembled a set of Zinfandels from various regions around Northern California for this tasting. 8TH PLACE: RIDGE VINEYARDS 2001 ZINFANDEL "LYTTON SPRINGS"
nose and on the palate it has stuffing (in spite of low acid), lush fruit and is very long - most enjoyable! Classic Zinfandel!" Bob found a "shrill, slightly bizarre wine; a leesy and grapefruit rind edge; moderate fruit; a 'picnic style' wine. There's some nice berry Zinfandel fruit but it falters while the tannins linger insistently." 7TH PLACE: SOBON ESTATE 2001 SHENANDOAH VALLEY ZINFANDEL "ReZerve"
sharp note indicating Volatile Acidity. It had an easy, jammy entry but was flat, dull with insistently bitter tannins." 6TH PLACE: TURLEY 2001 CONTRA COSTA COUNTY ZINFANDEL "DUARTE"
Tasters characterized it as "over-ripe and Port-like" "You better drink it up" "There's citrus and lemon and a long finish." Bob found "dull, ripe fruit reminding of prune-plum jam and more cooked, stewed berries on the palate and a 'tonic water, quinine-like' bitter edge." zesty mouthful, balanced with good concentration to the berry fruit." 4TH PLACE: RANCHO ZABACO 2001 DRY CREEK VALLEY ZINFANDEL "CHIOTTI"
Bob found a "jammy thing reminiscent of Southern Italian reds, warm, ripe and slightly Port-like but with decent balance." 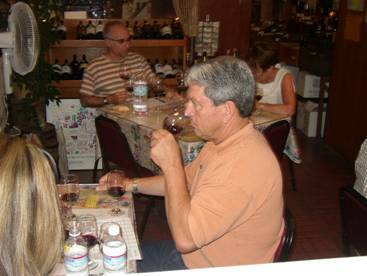 Gerald encountered lots of raspberry fruit in this wine, with a fair bit of tannin, but enough fruit to balance. "stinky", "skunky" and a "shrill, ammoniac edge"(Bob). "Raspy alcohol on the palate but I like it." Bob found some "decent Zin fruit in there, quite a big mouthful of ripe berries and sweet oak; not bad! 2ND PLACE: CLINE CELLARS 2001 CONTRA COSTA COUNTY ZINFANDEL "BRIDGEHEAD"
found "eucalyptus and mint" but one dissenter found it "bitter, hollow and fruit deficient." Bob found "bright, simple Zin fruit in a cloak of big oak with mint and clove at the edge. Quite a mouthful! 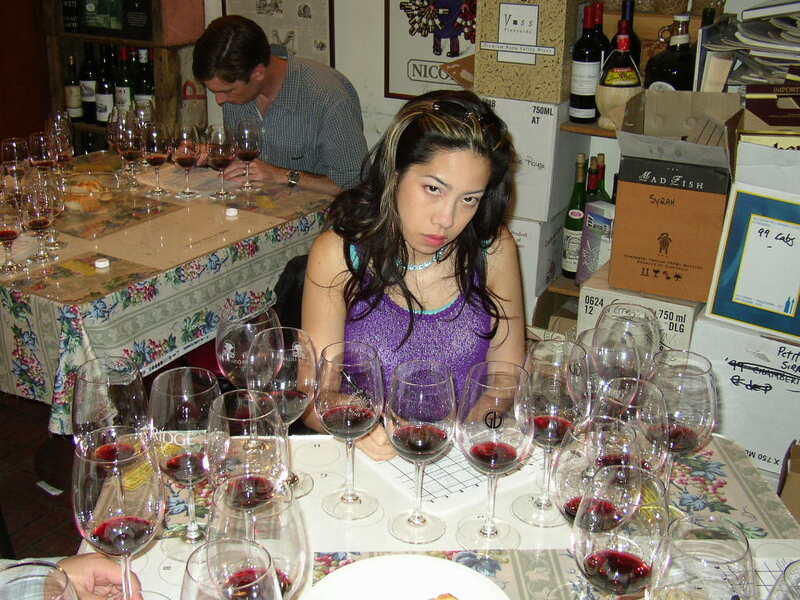 but there are some tough, bitter tannins and a flat finish, the wood tannins contributing a harsh finish." Gerald found lots of spice and sweet berry fruit in this very fruity red. 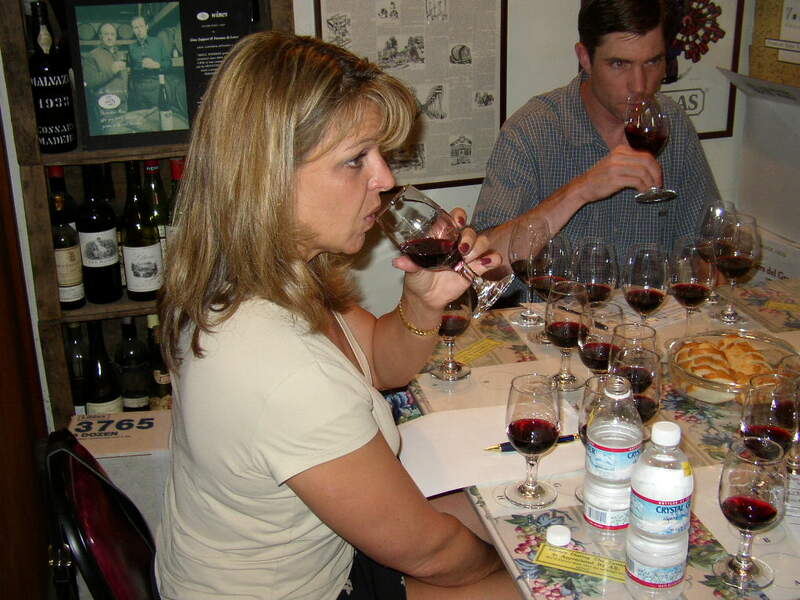 1ST PLACE: 2001 NEYER'S NAPA VALLEY ZINFANDEL "TOFANELLI"
This one found tasters enthusiastic. 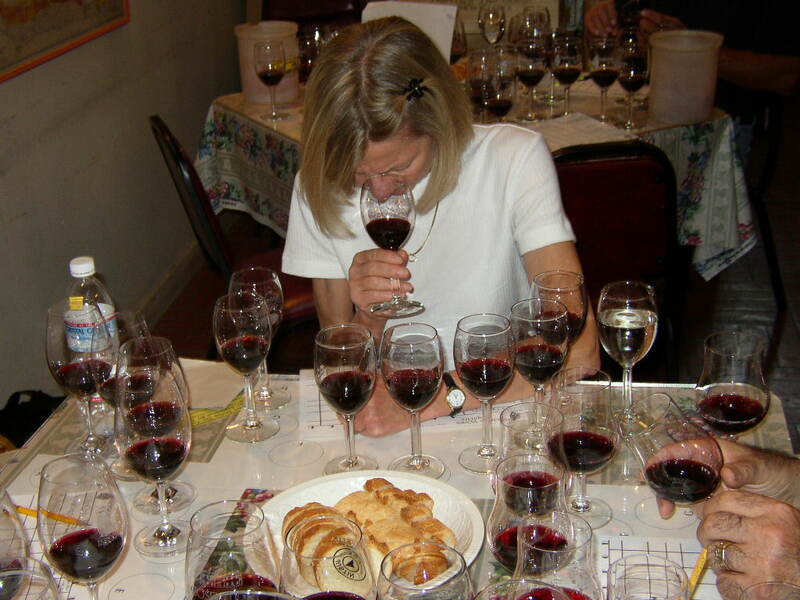 "Big briary Zin, sweet smelling with balance and structure." "Rich and full with a long finish" "Oak, ripe fruit, blackberries and licorice." But comments like "One-dimensional" and "Limp" made it less than unanimous. 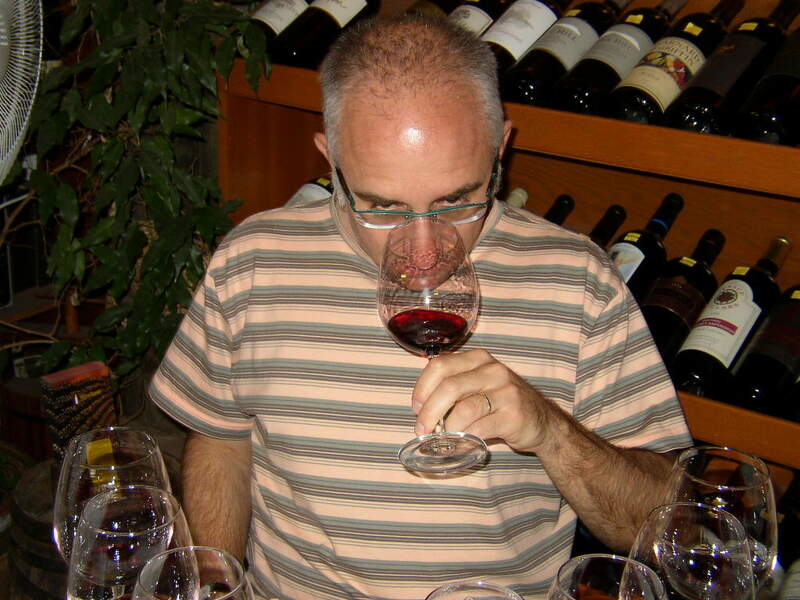 Bob found "a certain restraint which let the earthy, "terroir" notes come through. It has 'pretty' berry fruit and a nice oak background. Here's an easy, delicious Zin with fair length, berries, cherries and easy tannins; a winner!